I recently heard about a new study in the British Medical Journal that discovered that the human brain’s ability to reason, comprehend and remember may start to worsen as early as age 45. This was not music to my now 55-year-old ears. However, the study also shows the importance of a healthy lifestyle – including eating foods that are good for the heart and maintaining good cardiovascular health through exercise – which may help prevent the effects of brain aging. This is starting to sound better. Of course, there are plenty of great forms of exercise. For me though, running has always been a special delight. 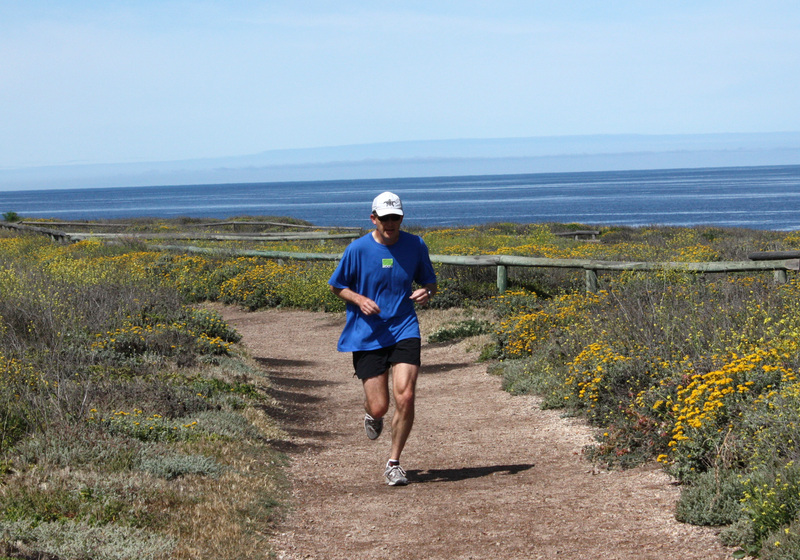 Here I am, in a photo my wife Dallis took a couple of years ago, running in one of my favorite places on earth, the bluff trail at Montana de Oro State Park near Los Osos, California. I realize that non-runners are puzzled by runners, but I have always looked forward to putting on my running shoes and heading out the door. When I was younger it was the thrill of competition that motivated me. Cross-country running required a combination of training, strategy and sheer guts, and there were plenty of times in high school or college that I was seriously in danger of losing my last meal out on the race course because of the intensity of the moment. I remember jostling with other testosterone-laden young men through narrow wooded paths, up steep slopes, across sloppy rain-drenched fields, all for the taste of victory. It was invigorating! Really … would I lie to you? It was! Anyway, that was then. 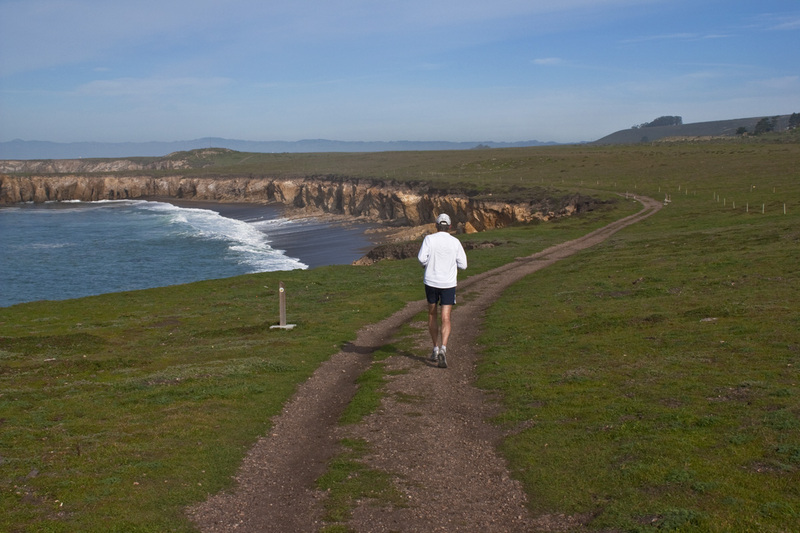 Today, thirty-plus years later, I still go out and run four or five miles several times a week. Naturally, I’ve gotten slower over the years. My legs require more “recovery time” in between runs. I’m no longer in it for the competitive thrill. I’m in it because it makes me feel good. Stress runs off my back (I bet you thought that was sweat). The fog in my head clears. My body comes alive (I know it’s alive because occasionally it complains just a little). I now run mainly for fun and exercise, but it’s an added bonus to know that running is good for my brain too. Without realizing it, I guess I have been taking care of my brain all these years by simply stepping out onto pavement or trail and putting some miles behind me! I have also found running to be a helpful analogy for living life. More than once, when I’ve hit rough spots in life, and I am out for a stress-relieving, heart-pumping, brain-improving run, I have recalled the familiar words of Isaiah: “Even youths will faint and be weary, and the young will fall exhausted; but those who wait for the Lord shall renew their strength, they shall mount up with wings like eagles, they shall run and not be weary, they shall walk and not faint” (40:30-31). Here’s to your health – holistic, head-to-toe, health in body, mind and spirit! Sounds like my yoga. Helps me remember that breath by breath, I am alive and blessed by The Breath of Life. Each breath reminds me that I am connected to the pulsation of the entire universe. In and out, up and down, dark and light, bad and good, …. life continues in its myriad expressions and I am supported by something bigger than myself. Just as I don’t really choose to breathe, I am breathed anyway. It’s kind of awesome in a way. As we keep on showing up in running shoes, or on the mat, or behind the lens – we get an opportunity to experience life that keeps on going, sprouting, fading, pulsing, …. and we get to be a part of it. I am grateful for that! I knew there was a reason we are friends! Very well said. Namaste.